Back in the early 1990s, a unique effort was made to address several pressing issues facing Reformed and Presbyterian churches. The issues of concern were primarily egalitarianism (leading to women in ecclesiastical offices) and evolution. This period saw a mass exodus from the Christian Reformed Church over these very issues and ones related to them. From concerned CRC and ex-CRC churches, an organization developed which eventually became known as the Alliance of Reformed Churches. The ARC was approached to convene a series of conferences aimed at developing a confessional approach to the above-mentioned issues of concern. The hope was that confessional documents could be developed which would provide the basis for doctrinal unity between various Reformed and Presbyterian churches in North America. The ARC agreed to take this on. The first Confessional Conference was held in July of 1993. Christian Renewal reported on it in the September 13, 1993 issue. Attendance was not all that impressive. Some of the noteworthy individuals in attendance were Dr. John Byl, Dr. Margaret Helder, and Dr. Nelson Kloosterman. Attendees came from Orthodox Presbyterian, Christian Reformed (and ex-CRC), PCA, Canadian Reformed, and other churches. The 1993 meeting reviewed a document prepared by the organizing committee on hermeneutics. Several speeches were also presented on the subject of creation and evolution. The intention was that a confessional document on creation would be prepared and presented at the next conference in 1994. I have been unable to find much about the 1994 conference. It was scheduled to be held July 13-16. From this report, it appears that it was held, but the attendance continued to be disappointing. Another conference was supposed to be held in 1995 to discuss ecclesiology, but because of the attendance issue, it was scrapped. One never hears about the Confessional Conferences again. From one perspective, the Confessional Conferences could be regarded as a failure. However, it was not a waste of time or effort. Today we still have two important documents that came from these conferences. These documents should receive more attention. The first is a Reformed Confession Regarding Hermeneutics. The second is a Reformed Confession Regarding Creation. These are both drafts primarily written by the late Dr. Greg Bahnsen of the Orthodox Presbyterian Church. Both are precise and faithful summaries of biblical teaching on these important issues. They feature affirmations of the correct teaching and denials of various false teachings. They are well-worth reading and studying. Why did the Confessional Conferences fail? Obviously the attendance was an issue, indicating a general lack of interest in North American Presbyterian and Reformed churches. Worse yet, there was especially a lack of interest from the membership of the Alliance of Reformed Churches itself — the very organization which agreed to organize these conferences. Moreover, the ARC was the vehicle engineering the launch of the United Reformed Churches. That took place in 1996. Much time and energy was being directed towards establishing a new federation and, understandably, there seems to have been little appetite for a broader outlook on unity. Could an idea like this be revived today? For example, could NAPARC be the vehicle to convene a new series of confessional conferences? We have to be realistic. I rather doubt that the appetite would be there any more today than it was in the early 1990s. Just observe that, since then, there have been further developments in various NAPARC churches. For instance, on the issue of creation and evolution, the URCNA took a position at Synod Escondido 2001. The RCUS has also taken a firm position, as have others. While it sounds like a good idea on paper, the reality is that the desire for developing a common confessional approach to these matters is going to be weak. Churches faced with some of these contemporary theological challenges today are going to be best off investing their time and energy with an “in-house” approach. I’ve been reading Iain Murray’s Revival and Revivalism this week. He discusses Charles Finney at length because of his role in the Second Great Awakening. Murray notes on page 262 that Charles Finney spoke of a “vicarious atonement,” which is usually another way of speaking about penal substitutionary atonement, i.e. that Christ took our place on the cross, bearing the wrath of God in our place. But Finney believed nothing of the sort. His language was deceptive. He used the right words, but he meant something completely different. The Canadian Reformed Churches are being attacked by dangerous false teachings. These teachings are not coming from outside, but from within. They are being promulgated by several (by no means all) intellectuals and professional scientists. These false teachings pertain to the relationship between science and Scripture, more particularly with regard to creation and evolution. This document outlines my position on these false teachings through eight position statements. The Bible is the authoritative Word of God. It is inspired, infallible, and inerrant. It stands supreme over all human thoughts and endeavours. Historically, those who have denied the inerrancy of Scripture have done so with an agenda often linked to scientific or historical concerns or doubts. The Bible is not a scientific textbook, but it does provide firm foundations for every scientific endeavour. All Christian scientists should approach their calling by first fearing the LORD and humbly honouring his Word above all. Psalm 36:9b says, “….in your light do we see light.” Colossians 2:3 tells us, “…in [Christ] are hidden all the treasures of wisdom and knowledge.” When the results of science and the clear teaching of Scripture appear to conflict, the Christian scientist is called to submit to what Scripture says and modify his scientific theories accordingly. Theistic evolution in its various forms teaches that God used evolutionary processes to bring about the creatures that are described in Genesis 1 and 2, including man. Theistic evolution is a serious error in conflict with God’s Word. It requires a radical reinterpretation of Genesis 1 and 2 to explain away certain aspects and make room for science. Historically, the same hermeneutic has been employed to deny the virgin conception and physical and historical resurrection of Jesus. The hermeneutic which allows for theistic evolution opens the door to a denial of the gospel. This is why I say that we are being assailed by a dangerous false teaching. The plain reading of this passage categorically rules out any notion of hominid ancestors for Adam. God formed Adam, not from some pre-existing creature, but from the dust of the earth. “Man became a living creature” at this point – that implies that he was not a living creature prior to this moment. To reinterpret these words to accommodate any theory of evolution is unbelief. It is sin against the first commandment. It is a refusal to accept God’s Word and a form of idolatry. In the past there have been Reformed theologians who have held various positions on the age of the earth. This does not say anything about whether such positions are true or false. Such positions may have been tolerated, but this could have been because of a lack of foresight as to where such positions might lead. The Canadian Reformed Churches have expressed concerns to the United Reformed Churches about the toleration of the Framework Hypothesis. The Framework Hypothesis leaves the door open for seeing the earth as millions or billions of years old rather than thousands or tens of thousands. This in turn more easily accommodates theistic evolution. Still, no URC ministers are known to be promulgating theistic evolution. No Reformed theologians in the Canadian Reformed Churches have promulgated theistic evolution. Theistic evolution is now what is being promulgated by various intellectuals and scientists. This is what must be addressed and refuted. The Confessions are not a wax nose that can be turned any way we please. For example, Belgic Confession article 14 references Genesis 2:7, “We believe that God created man of dust from the ground…” When the Confession was first adopted by the Reformed Churches, it was understood that this meant that God literally created man from the earth. Prior to Adam, there were no “Adam-like” creatures or hominids. The first commentator on the Belgic Confession, Samuel Maresius, was familiar with the idea of pre-Adamites in his day. He wrote a lengthy refutation of the notion. Likewise, in his commentary on the Confession he indicates that the Confession means what it says. There is no room for pre-Adamites in the Belgic Confession. When the same Confession was adopted by the Canadian Reformed Churches, there was the same understanding. There is no “wiggle room” in this statement. It is disingenuous to suggest otherwise. Nevertheless, it may be advisable for our churches, in consultation with our sister churches and others (at ICRC and NAPARC) to add a clarifying statement in article 14 that rules out any possible notion of pre-Adamites or theistic evolution. The question of creation and evolution is not a widespread global issue amongst Christians, whether new or more mature believers. It is more of an issue amongst North American and European academics in urban environments. One should not be tempted to reconsider the issue of theistic evolution on the basis of an argument that this is a significant concern for Christian mission. All office bearers have a duty to “oppose, refute, and help prevent” the errors of theistic evolutionary thinking in the Canadian Reformed Churches. Whether in public (from the pulpit) or in private discussions, ministers have a responsibility to give clear direction from the Word of God and call those to repentance who are harbouring, tolerating, or teaching such errors. Consistories have a responsibility to use the keys of the kingdom of heaven to bring brothers and sisters who harbour, tolerate, or teach such errors to real amendment and repentance. A failure to carry out this calling will be detrimental to the spiritual health of the Canadian Reformed Churches. One of Canada’s longest running radio shows is CBC’s Quirks and Quarks. Each Saturday, host Bob MacDonald features a series of clips on different news items from the world of science, medicine and technology. I’ve been listening to this program on and off since I was a kid. It’s always interesting – and you can always count on MacDonald to bring in the “E” word: evolution. It’s a subversive approach to convincing the Canadian public of this doctrine, as if the sheer repetition of something week in and week out will make it true. The February 25, 2012 edition of Quirks and Quarks took the evolutionary agenda one step further. One of the segments was about gelada monkeys. These baboon-like monkeys live in the highlands of Ethiopia. 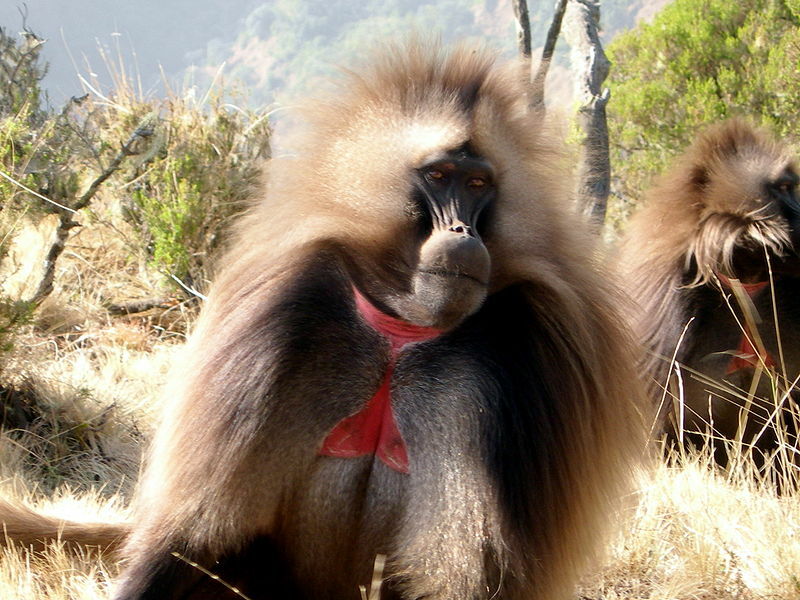 They live in a harem structure – with one male gelada monkey heading up a harem of many females. When a new male monkey takes over a harem, the females that are pregnant typically miscarry. If they don’t, the new male leader will often kill the infants and newborns. The theory is that the females miscarry in order to “cut their losses” and start over. They typically are impregnated by the new male leader in a short period after their “spontaneous abortion.” Of course, this is regarded as an adaptive strategy, something that has evolved for the advancement of the species. Monkeys have allegedly evolved with abortion as a way to maintain and improve their kind. The researcher, Dr. Jacinta Beehner, made it clear that that the female monkeys don’t choose to miscarry. It’s something that spontaneously happens. They don’t deliberately cause the loss of the unborn monkey in any way. Yet, throughout the interview, MacDonald continued to speak about the female monkeys making a choice in the matter. The expression “cutting their losses” was used repeatedly by MacDonald. It was pretty hard not to read between the lines. The Quirks and Quarks website makes it even more clear. It speaks of female geladas spontaneously aborting their pregnancy, as if they have a choice. We’re told, “Essentially they are ending investment in offspring in-utero that have no future.” Hmmm….not too subtle. Caveat auditor – let the listener beware! The Theology of B. B. Warfield: A Systematic Summary, Fred G. Zaspel, Wheaton: Crossway, 2010. Hardcover, 624 pages, $44.00. Ninety years after his death, Benjamin Breckinridge Warfield continues to be a respected voice in Reformed theology. Along with Jonathan Edwards, the Hodges, and a few others, Warfield is one of the pre-eminent Reformed theologians in North American church history. Yet for all his renown, few have given him a careful reading. Popular ideas persist about what Warfield believed about this or that. Part of the problem is Warfield himself never systematically laid out his theology in one place. Fred Zaspel has therefore done us a favour by carefully collating Warfield’s theology into one helpful volume. 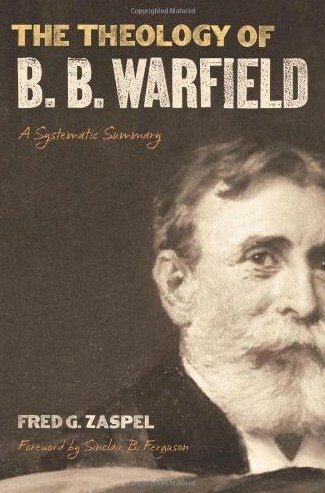 After an introduction surveying Warfield’s life and work, Zaspel follows the standard topics of systematic theology and distils Warfield’s thought on each one. Here and there he also interacts with interpreters, particularly the ones whom Zaspel feels have not done justice to Warfield. Zaspel himself is a sympathetic interpreter. A Reformed Baptist pastor in Pennsylvania, he is broadly in agreement with Warfield’s theological bent. Where he personally might depart from Warfield (regarding infant baptism, for instance), Zaspel remains respectfully silent, just simply laying out the Princeton theologian’s views without comment. At the end of the volume he does offer some critique, but for the most part he allows Warfield to speak for himself. That’s not to say the book consists mostly of quotations – most of the time Zaspel summarizes and paraphrases. The Theology of B. B. Warfield will appeal most to pastors, scholars, seminary students and informed “lay people.” Like Warfield himself, it is not light and fluffy. Technical language is used and readers are expected to have an intermediate level of theological knowledge. There are four areas in the book especially worthy of further comment. Early on, Zaspel deals with Warfield’s views on apologetics. He argues that Warfield has been unfairly portrayed by later Reformed apologists such as Cornelius Van Til. Van Til argued that Warfield did not give adequate expression to the effects of sin upon the unregenerate mind. Zaspel attempts to defend Warfield against this accusation. He notes that Warfield did not attribute “right reason” to the unbeliever and spoke repeatedly of the pervasiveness of sin (77-78). However, Zaspel also states that Warfield maintained that unregenerate man “is able to see the compelling force of ‘right reason.’” Unfortunately, Zaspel is unable to see that this justifies Van Til’s complaint. While he adds some useful nuance to Warfield’s views, Zaspel does not succeed in exculpating Warfield on his inconsistencies in apologetics. Warfield is known as the great defender of biblical inspiration and inerrancy. Therefore, one would expect a book of this nature to deal with those subjects at length. Zaspel does not disappoint. He outlines how contemporaries of Warfield and latter-day interpreters have accused the Princetonian of “rationalistic scholasticism” in his doctrine of the Bible. He helpfully illustrates how these charges fall well short of the mark. A third area of interest is Warfield’s thought on evolution. The claim is often made that Warfield had an appreciation for evolution. The argument is advanced that if Warfield can be regarded as a great Reformed theologian and he held to evolution, then how can contemporary advocates of evolution be excluded from Reformed churches? Those making such claims ought to read Zaspel’s careful summary of Warfield’s views and how they developed. He concludes Warfield could at best be said to have been noncommittal or to be critically agnostic (386-387). However, Warfield also developed a “strengthening conviction against evolution” (385). Finally, one of Warfield’s greatest concerns was the influence of perfectionism or Keswick “higher life” spirituality. In his day there were popular preachers and writers claiming it was possible for Christians to no longer sin in this age. There were also those who claimed that Christians should not regard themselves as sinners, since they are a “new creation in Christ.” They denied the biblical teaching that, in this age, we are both justified and sinners (simul iustus et peccator). These false teachings are still around today. Today we still need Warfield’s biblical defense against these errors. Zaspel provides a helpful door. Warfield approvingly quoted Thomas Adam, “The moment we think we have no sin, we shall desert Christ” (465). The Theology of B. B. Warfield is a comprehensive guide to the thought of “the Lion of Princeton.” There’s no question it will be a standard reference for decades to come. Anyone interested in the development of Reformed theology on our continent needs to have it and read it.